Fans of Disney World know that when you plan a trip to see the mouse, you have to book your dining reservations 180 days in advance. It might seem a little strange but if you don’t make those reservations, you may not get to eat where you want, when you want. Many of you know that I’m going back to Disney World in January for marathon weekend to do Goofy’s Race and Half Challenge with my running group. Which means our 180-day window is coming up and it’s time to get organized. One of our group meals is going to be at the Polynesian resort. It’s my favorite resort at Disney – I love the theming of the resort and I think it has some of the best restaurants on property. That got me thinking about some of my favorite foods from the Polynesian. One of those is ‘Ohana’s Pineapple Breakfast Bread. While I can’t always eat at ‘Ohana, I can make one of my favorites from there. I’ve said it before – there’s nothing quite like bread that’s fresh out of the oven and this is no exception. I love the smell of bread baking in the oven! 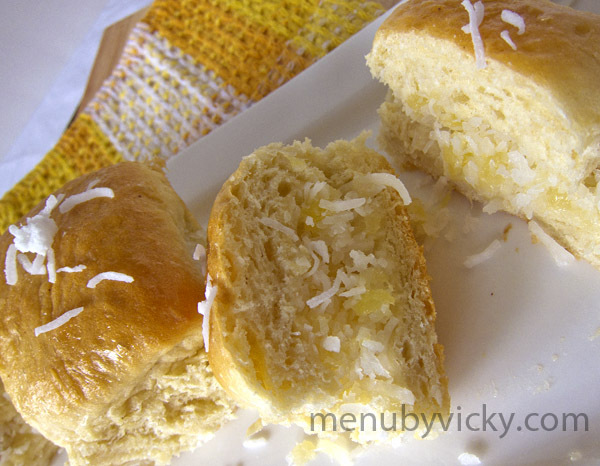 The pineapple/coconut mixture gives the bread a slightly gooey texture and a nice sweetness while the bread stays nice and moist. 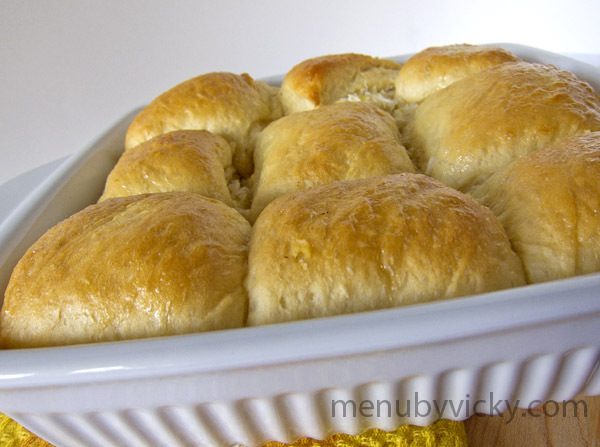 The pineapple bread is so scrumptious on its own, you won’t even need to add butter to it. This would be perfect for the next breakfast or brunch you’re hosting. Have you been to Disney World? What are some of your favorite foods there? In a mixing bowl, combine the pineapple and unsweetened coconut flakes. In a separate bowl, add the sugar and cornstarch and mix. Add to the pineapple coconut mixture and mix well. In a large mixing bowl, add the water, instant yeast, bread flour, sugar, shortening, egg yolk and salt. Mix with a dough hook on low speed until a dough begins to come together. Continue mixing for another 5-7 minutes until the mixing bowl is clean. Lightly flour your work surface, turn the dough out and shape into a ball. Cover with plastic wrap and let the dough rise until it doubles in size. This should take about 45 minutes to an hour in a warm kitchen. Pre-heat your oven to 110F. Punch down the dough and roll out the dough until it is 2 inches and the shape of a rectangle. Drain the pineapple/coconut mixture, spread it on top of the dough and fold the dough in half (into itself). Grease a 9″x13″ pan and place the dough onto the pan. Using a pizza cutter to cut the dough into pieces and spread the pieces out evenly in the cake pan. Place the cake pan into the oven and let the dough proof until it’s about half way up the pan. Bake the bread at 325F for 20-25 minutes or until golden brown. Cool the bread and serve. Recipe notes: The original recipe called for high gluten flour but I found that bread flour worked just as well. I’d also suggest draining the crushed pineapple because the pineapple/coconut mixture is too watery otherwise. oh my this looks to good for words!! Beautiful bread here. I can think of so many appropriate jams to slather on! A wonderful, light breakfast bread to start the day. Two of my favorite flavors mixed together in a freshly baked bread. I can’t imagine anything better. Thanks! I love pineapple and coconut together! YUM! I love coconut! That should go so well with pineapple! Oh my gosh, drool. This bread looks so good. I love Hawaiian sweet breads too. Great recipe! This looks delicious! What a combination! Like a virgin pina colada in bread form! I have sadly never been to Disney World. But I really want to go! This looks so good! I used to go to Disney World all the time as a kid but now living in California, we have Disneyland (which I admit I am really afraid to go now for fear of being disappointed!) Guess I’ll just have to make that trip to Florida! Wonderful bread, soft and lovely. I have never been to disneyland but will someday inspired by your post. This looks like a great combination..coconut and crushed pineapple..the recipe calls for 13/4 cup of water,is this the right amount,seems like a lot for the amount of flour used..